Having trouble finding a running shoe that fits just right? That may not be a problem for much longer. If experiments underway at New Balance are borne out, within a few years customers may be able to go a store to have key portions of a shoe custom-made to provide optimal fit and support based on their individual biomechanics, such as how their foot strikes the ground. The breakthrough comes courtesy of 3-D printing, a relatively new technology that is not really printing in the traditional sense; it is a machining process that lays out thin layers of materials — in this case, a nylon polymer — to build a three-dimensional product in the exact form of a digital model. Each shoe can be made off a different digital model of a runner’s foot, a radical difference from the traditional method where a manufacturer uses a single model — an injection mold — to make a shoe used by thousands of athletes with a wide range of running strides and styles. The new system takes into account all the subtle ways one runner’s stride differs from another, from the amount of power in each foot strike to the quirky angle the sole lands on the ground, and designs a shoe that fits just that one runner. “It feels so much more natural with the bounce and responsiveness,” said Jack Bolas, the first professional runner to use a 3-D printed track spike in competition, at the New Balance Games in January in New York. “It’s flexible and forms to my foot and foot strike, but doesn’t make me feel like I’m losing anything,” added Bolas, a former four-time All-American middle-distance racer from University of Wisconsin. For now the Boston shoe company is experimenting with the highly specialized soles on shoes used by elite track athletes such as Bolas, but company officials said they are expanding into general consumer products that, if successful, could become available at specialty locations within five years. 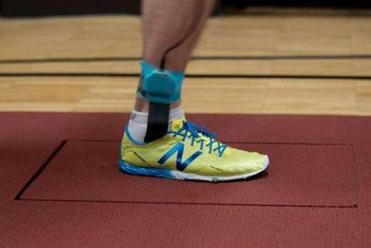 At its innovation studio in Lawrence, sports research manager Trampas Tenbroek asked a company employee to demonstrate how New Balance makes a customized shoe plate for Bolas and other athletes. For now they are designing the spike plate — the bottom of the superlight shoes where track racers insert running spikes for improved traction. First the employee slipped what looked like an ordinary insole into a running shoe; but this insole contained 99 sensors that tracked and transmitted the dispersal of pressure as his foot hit the ground. He then strode down a short runway and in the middle landed on a glass plate that measured the force of his foot strike. Meanwhile, New Balance used eight motion-capture cameras to track the position and direction of his foot upon contact. It takes anywhere from five to 10 trial runs for New Balance technicians to collect enough data to design a spike plate with a precise combination of traction elements to optimize the runner’s interaction with the surface. New Balance will also bring the force plate to running tracks, where its sponsored athletes will take turns running on it at different points — around a curve — for example — to create a more complete picture of how their stride works during a race. The athletes are then asked to practice with several designs and provide feedback to tweak the custom design. For example, commercially available running spikes all come with the individual spikes set in common positions. But Barbara Parker, an elite middle-distance and steeplechase runner from Britain, found the placement of one of those spikes on her shoes so annoying that it irritated a bone in her foot. The 3-D printer moved the position for that spike to a more comfortable location. Indeed, some runners said most of the track shoes they have worn until now have been uncomfortable. “I hadn’t found a spike you put your foot into and take off from the starting line and melt into,” added Bolas, who finished fourth — three seconds off his personal best — running the mile at the New Balance Games with the 3-D spike plate. The spike plates for Bolas and other New Balance athletes are “printed” by a process called selective laser sintering. The process essentially builds the shoe part by applying individual layers of powderized polymer on top of one another. Based on the data compiled by the running tests, the machine can make each layer, roughly 0.12 millimeters thick, unique, to build a sole that exactly fits that athlete’s stride. New Balance is using 3-D technology to make custom midsoles, that crucial part of the shoe that provides cushioning, support, and shock absorption. The traditional midsole is produced by injection molding and has one surface, with foam on the inside. The new process allows New Balance to layer the interior support system so that it provides more energy to the runner. The company’s near-term goal is to make custom spike plates and midsoles available for competitive runners in select New Balance locations within five years and then, custom shoes for regular runners willing to spend more for a tailored shoe. Petrecca said the cost of these New Balance products will be high and remain so until the demand increases and 3-D printing technology improves. Nike is also using 3-D printing in its shoe line, introducing a football cleat in February with a spike plate made by the selective laser sintering process. E.C. “Ned” Frederick, a biomechanics expert who runs a widely used research facility for the industry in New Hampshire, said manufacturers have been using technology to improve the fit of running shoes for years, with New Balance in the lead on using 3-D technology for custom soles. “The possibility is on the horizon to use all of this scientific information about the functional requirements of footwear and measurement technology we have to improve the footwear we provide people,” said Frederick, president of Exeter Research in Brentwood. One of the big benefits of 3-D printing for product makers is the opportunity to abandon a manufacturing process that requires them to make their models en masse before they sell them.